Colonial America is in rebellion. A desperate war for freedom has begun. But another war is about to be fought; a war in the shadows of a greater struggle. The Freemasons and their rivals the Illuminati are entering into a supreme struggle for control of the new republic. All wars must be fought with weapons and the greatest of these is knowledge. It is a hidden knowledge that American Freemasons directed by Benjamin Franklin mean to obtain at all cost. And they have just the man at hand, Captain John Paul Jones. Readers choose books based on recommendations. Leaving an Amazon review is like telling your friends how much you liked your last read. After 30 reviews Amazon includes the author’s book in “also bought” and “you might like this” lists. This increases its visibility on the site and boasts sales. After 70 reviews, amazon highlights the book for spotlight positions and includes it in its newsletter. That is a HUGE boast for the author. Please leave a review at Amazon. As you are no doubt aware as last we spoke in Philadelphia, there was much that lay uncertain concerning the affairs of these, our, American Colonies. And her future with England. And as Brothers of Freemasonry, it has always been our intent to come together in good faith and fraternity, and by the blessings, of a just and divine Providence, so guide these Colonies with the wisdom of virtue and good governance. In the simplest terms, it was always our desired end to provide a benevolent light before our countrymen by which they might follow into prosperity and brotherly love. But now it seems we must protect, as well as provide for the liberties of free men, for it is an unfortunate truth that war is now upon us, and many men will die. But all hope is not lost, for I have discovered a thing which may yet preserve us. I have discovered the Great Secret! That which we have discussed long into the night hours has at last been found, and if it can be reached, mankind may once again be emerged from darkness, as once we were in that classical age. The age of enlightenment shall find yet more light, if this, our endeavor be successful. We must soon depart, For a great conflict, as well as a great opportunity awaits. and a great ship must needs be commanded, by a great captain. To this end, we must prepare. 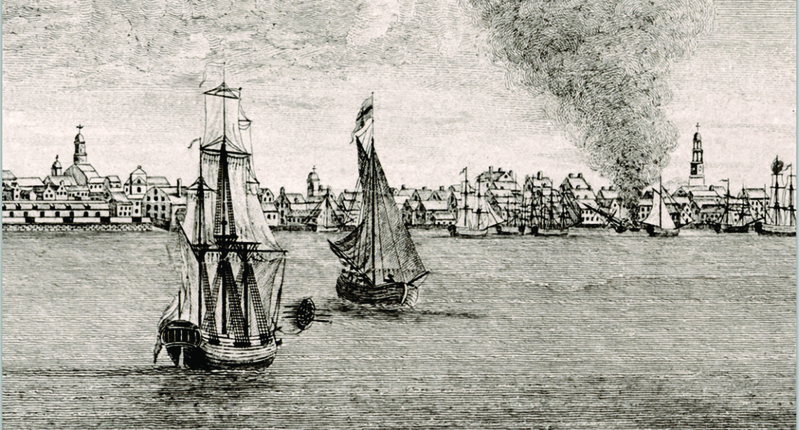 A merchant ship of London registry out of Tobago is to be expected in Fredericksburg. Go there and find the Betsy, find her Captain, who should with all speed be brought into our fold. He is a man of impeccable quality in the skills of seafaring, as I have been informed, and is of undaunted courage and fighting ability. Trouble should be expected upon his arrival, as I am given to understand he is quite dashing, handsome, and slightly deficient in character. So do bring with, our Lady, Elizabeth, to fetch him, then report to me in Philadelphia as quickly as possible. His name is John Paul Jones. Philadelphia J. Jackworth stepped into the tavern, The Barnacle, it was, and adjusted his Franklin Monocled Unifocal strapped to his right eye. It was a marvelous piece of engineering, elegant in its simplicity, if a bit odd to look at. It was like the collapsed nub of a spyglass, with several lenses of differing properties. Each could rotate in and out of a hidden recess, and be thence set before the eye, allowing one to see with a magnified clarity. He waited a moment to let his sight adjust, and squinted, to accommodate. Normally he would have offered the door to the lady first but he strongly suspected the good people of The Barnacle, might not be terribly discriminating in the character of their clientele, and so he thought it prudent, just this once, to go first. If even, she were the more martial of the two, decency still forbade it. A smoky, fire lit den of raucous noise, dubious characters, and dancing maidens met them as they took in their surroundings. The scents of cooked, hot food, mingled with home grown tobacco, close bodies and cheap beer wrapped them in its cloying blanket while blue smoke from a dozen pipes filled the air. A half dozen half interested denizens checked to see that character was checked at the door, with the arrival of all newcomers, and then returned to their conversations, satisfied. It was in short, the sort of seedy heaven sailors called a home, when they were not at home, on their ships, on faraway seas, delivering a merchant’s goods, or fighting upon the waters in a splintered, fiery fight of sword and cannon, and plunder and death. They were naught but a moment in the doorway when Philadelphia spied him. “I believe I have found our man.” He said, nodding in direction. Elizabeth’s eyes followed, and then across, directly from him, at another who seemed to have found the quarry at the same time. Without the need for word she stepped out of the doorway and made for the opposite end of the bar where it seemed trouble might be brewing, and within an instant her demeanor changed, to blend in with the crowd. And Philadelphia J. Jackworth went to introduce himself. Jones was young, twenty something, with light brown hair and hazel eyes. His handsome face wore the lines of experience at the corners of his eyes like a hardness, that hid a softness of vulnerability within. But by all accounts it was said those same soft eyes would become suddenly ablaze with a brilliant love of war, and tenacity of bravery at the first roar of cannon. His nostrils would flare and his body would glow with the strength of command, as if a sea warrior born of Neptune and bred for a fight. It was said at 12 he had been a midshipman aboard a merchant ship, whose Captain had perished in a battle with pirates and all hope, thought lost. But Jones had seized command, rallied the crew, and won the battle. Then fought the ship through storm and trial back to port. Of course it was also said that every ounce of bravery was equaled by two of mismanagement. He wasn’t the best with money, and a certain acumen seemed always lacking. And so there lent, an unfortunate affair between Captain, and his business. Battle always left him the greater prize. But selling the ship for the money it was worth was a different story. Prize ship agents loved Jones. And crews were a jilted lover, still in love, but all out of trust. After a polite moment with the gentleman still standing at his table, Jones had still pretended he wasn’t there and Philadelphia softly cleared his throat and spoke again.